At its core, the intense drama Omnium Gatherum is a contemporary mix of tragedy and travesty. The tale of seven guests and a hostess feasting on a gourmet meal at a luxurious Manhattan dinner party while the recollections of a hellish day in American history hang like a dark pall and gush from a dungeon-like lower hallway, tests the audience’s ability to absorb bitter sarcasm and stinging satire without flinching. In the end, we all learn from this well-produced, well-acted and thought-provoking play that survival is not out of reach. 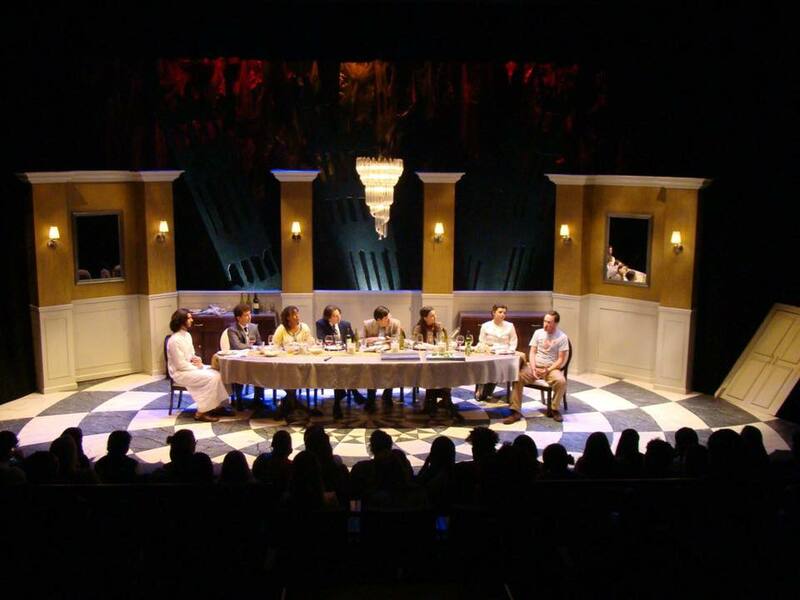 The 2003 play by Theresa Rebeck and Alexandra Gersten-Vassilaros, who wrote it just two years after the horrific 9/11 terror attacks on the United States, opens the 2016-17 season of plays presented by grad students in the Department of Theatre and Dance at Florida Atlantic University in Boca Raton. Those who have followed the theatrical goings-on at FAU for the past few years will see a new cast on the opulently appointed stage of Studio One. Shows that entertained us with ancient tales, Shakespearean whimsy, knightly feats and a Steve Martin farce featuring a time-traveling Elvis have become part of history. The incoming theatrical class has plenty of tricks up their sleeves, as depicted in this show that nearly copped a Pulitzer Prize for drama. 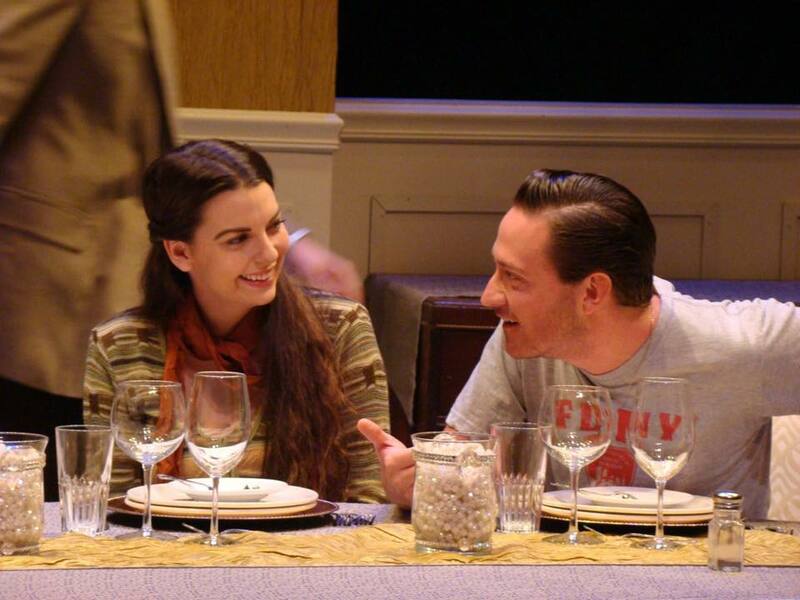 Each actor brings a special talent to the FAU stage, and all have made their mark in theater around the nation. The program cover hints there may be something very unusual about this play. Two towering structures resembling stacks of cards are shown in varying hues of pink, with smoke drifting across, but not from, either. The scene seems as innocent as the dinner party prepared by Suzie (Amanda Corbett), a former caterer who has risen to gustatory maven status. She has invited a bevy of sophisticated stereotypes to enjoy delights like pan-roasted Columbia River salmon and roasted Moroccan spiced lamb, all washed down with many, many glasses of wine. Before the guests arrive, emerging from a bulkhead that belches smoke and people, the sound of a pilot welcoming passengers aboard “American Airlines Flight 175…” is heard offstage. (That Boston-to-L.A. flight crashed into the South Tower of the World Trade Center). Periodically during the play, the stage darkens, the actors stop and the whip-whip roar of helicopter blades is heard. Dinner guests seem to represent a cross-section of cross people, all prepared to pontificate and argue about whatever comes to mind – terrorism, pop culture, feminism, food, wealth, heroism, morality and justice. While the banter is sometimes witty, the real focus seems to be on filled wine glasses. Gray West, Madison Spear and Sean Patrick Gibbons in Omnium Gatherum. (Photo by Jessica Cowden). 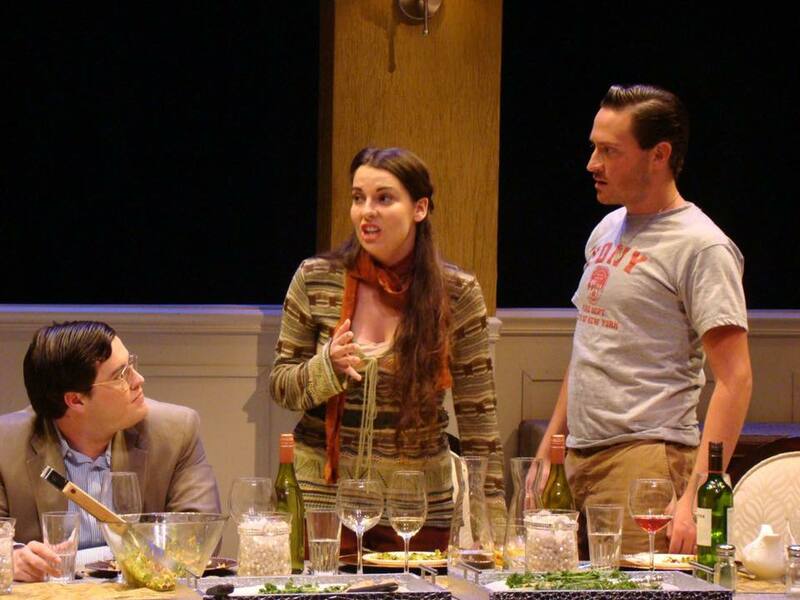 At the table are Roger (Gray West), an American writer with a big mouth and ego to match; Lydia (Madison Spear), a feminist, activist and vegan who vows “not to eat anything with a face”; Julia (Rachel Finley), the sole African-American person who comes to dinner; Khalid (Trayven Call), a talkative man of uncertain origin; Terence (Zak Westfall), a British journalist and foil to Roger’s mouthy remarks and Jeff (Sean Patrick Gibbons), the quietest man in the bunch, known only by the “FDNY” T-shirt he is wearing. Arriving unexpectedly is Mohammed (Manny Zaldivar), whose late entry and tirade of his own abets the turmoil which is becoming rampant. Throughout the evening, while Suzie offers lengthy descriptions of her fine foodstuffs, the guests – fueled on rancor and wine – turn from conversation to satire, from comedy to realism and to satire and finally chaos. The smoke-belching hallway is never truly explained, but guests who traverse it say it leads to a luxurious lavatory that more resembles a ballroom than bathroom. Smoke continues to billow, and while the doors are open, the audience sees fiery red shadows along the wall. Is this hell? Or a hellish nightmare? Or could it be the place where those who died in the flaming pit that became Ground Zero are entombed forever? The cast of Omnium Gatherum. (Photo by Jessica Cowden). This group of persistent FAU student dramatists does an excellent job presenting a tough play in an intriguing way, while allowing the audience to pass judgment on the characters. They manage to encapsulate each role and present it in a way that’s real and truly focused. The same goes for Linser in his strong, directorial role. And the props crew deserves credit for keeping all the wine bottles full. Omnium Gatherum, whose second week of performances was canceled for Hurricane Matthew, has been rescheduled for 7 p.m. Saturday and 2 p.m. Sunday at the Studio One Theatre at FAU’s Boca Raton campus. Tickets are: single adult, $20; faculty, staff, alumni, $15; students, $12. To purchase, call 800-564-9539.